Let’s be pragmatic realists but pragmatic and realistic in a different reality than the one Hillary imagines. In our reality, there is a crucial need to change the rigged game we are in (the one that constructs the reality Hillary is anxious “to work with”). When 20 Americans have more combined wealth than the bottom half of the population you need to think something is rotten right here in River City, not Denmark. 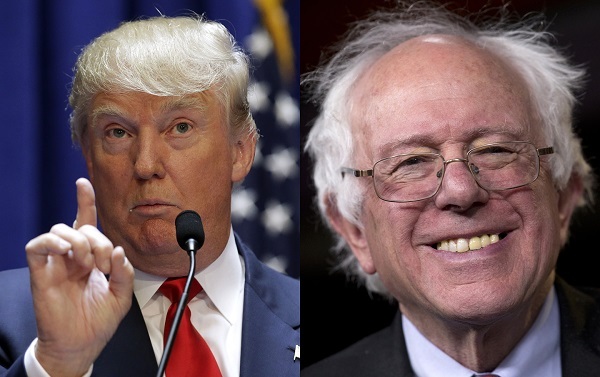 I offer this: when Bernie fails, look to Trump to wreak havoc, raise hell and hackles. It is a risky enterprise but Trump is sure to continue shaking up the game for Neoliberals. Those who now flock to Trump and are undeterred no matter what is said or done are driven to change the game, but it’s not the one Bernie Sanders is exposing. The passion Trump arouses is to be outside politics as usual; when troubling conditions remain opaque and confusing, the first impulse is to upend the table. Trump personifies that action. It is what we have reached short of a Bastille like revolt. This anger is not going away with a Hillary presidency but the ruins of an impeached Trump presidency may lead to a greater reception not for another Liberal or another Neoliberal but for a climate crisis and labor not capital prioritizing candidate. Beyond turning the Republican Primary into a nasty street brawl, the entertainment part the media feeds on for viewers and advertisers, Trump has openly played all the cards of dark innuendo, exposed all the codes of racism and bigotry that have been Republican strategies to keep the game rigged. Attend to where the fear is: it is not fear of Bernie Sanders’ socialist-like leanings because Hillary has disposed of that. It is not fear of Hillary; she is not likeable at all to any Neoliberal but she is not a threat to foundational Neoliberal beliefs. Trump will do damage to that hypocritical façade which a resident plutocracy needs in order to avoid outright revolution. Hillary will do none. What I am suggesting is risky and counter-intuitive given the fact that Trump’s iconoclasm may be similar to using a deadly virus to kill a cancer. Nevertheless, Trump rather than Hillary as the preferred candidate to tear apart a rigged system is worth exploring. I realize such an exploration will drive gentrified Liberals to twitter, Neoliberal moguls to fund a greater Anti-Trump effort, and the Trump throng to read beyond this paragraph. I explore with my own caveats in italics. Those on the credit and not the debit side would question this description of the GOP and our operative form of “free” enterprise. When spins like these fail to hook any fish, what you see is a fear of a man who could put the screws to quant hedge fund masters and billionaires, “full service” investment banks like Goldman Sachs and Morgan Stanley, and tax dodging U.S. corporations like Triton, Fruit of the Loom, and Playstar. Trump could ransack the treasure troves of the investment houses, upend the Wall Street players, vaporize the hedge funds, stick it to the Big Banks, indict the plutocrats, seeks revenge on a moneyed class that threatens him now. Trump being Trump he could of course become a Paul Ryan pupil and in six months graduate into the “pure” Neoliberal faith. He could also become a figurehead and let new Kissinger/Cheney types run the country. But Ahab did not give the ship over to first mate, Starbuck. Megalomaniacs don’t do that. On the other hand, the plutocratic order may remain hidden while the media feeds on Trump, personalities, especially oversized ones like Trump’s, are easier for journalists, Americans de facto public intellectuals, to explicate than the circuitry of the dark matter of our financialized capitalism. When an egoist of the first order also holds the title of The President of the United States, the most powerful and feared country in the world, any and all opposing forces of power and privilege can only be seen, from that perspective of egoism and power, as heretical and disloyal subjects to be crushed. (?) This has been Trump’s winning style throughout the Republican Primary. Trump, however, might only be surrounded by loyal subjects and kept in a cloistered bubble. It has happened before in the White House. There has not been a force in American politics greater than Donald Trump as he is now positioned who has had the power to plunge the entire country into a dark whirlwind, pushing us toward crash. You have to review your 20th century European history to find his like. That crash is not like the crash Wall Street is once again heading toward, slipping by and through governmental roadblocks that do not go beyond signage. It is a crack-up of business as usual, of longstanding pacts of collusion, evasion and cover-up and their replacement by a seigneurial order modulated to the whimsical whim of one man. Donald L. Trump. Not only will Paul Ryan’s magisterial project to establish a true Neoliberal order be mocked into ashes by the Executive of his own party but also mocked will be that party’s failure to detach itself from the monster of Ego, Wealth, and Prejudice that it has created. Dr. Victor Frankenstein’s rush to detach himself from his own creation is a fitting analogy for the Republican Party’s predicament here. For those on the “Winning” side of things, penthouses are not a netherworld. It is enjoyable to watch Trump Go Street, disregard the Marquis of Queensbury rules, and lure the antagonists of his own party into taking priestly censoring postures that expose their own fraud and phoniness in a totally unaware, hypocritical fashion. Ironically, Trump’s “art of the deal,” the business deal, on the stage of national and global politics, is what the business community fear. It is a deal that will end business as Romney’s Bain Capital, that exemplar of truth and honesty, defines it. Or, Trump’s misrule may further the atmosphere of confusion, one already suffocating itself on cyberspace communication. Or, we can take the tack already expressed: Trump was a lousy businessman and therefore what we did is a real, successful businessman as president. But beyond our plutocratic order and the Republican Party being at risk, isn’t our democracy at risk with a Trump presidency? Shouldn’t fear that this would surely happen with a Trump presidency make us feel guilty about whatever fun we get from watching Trump burst paper bags of horseshit like Rubio, Cruz, Bush, Romney and party? Isn’t Trump THE chosen dangerous bag of horseshit that can make the country vulnerable to a future despotic, evil minded dude who is crazed and egomaniacal but also has a “New Order” in mind? One matter of which you can remain assured: Donald Trump has no order in mind, new or old. Trump may elude impeachment, skillfully steering a course away from “treason, bribery, and other high crimes and misdemeanors.” He might not tape himself in the Nixon fashion. Monica stories may be greeted with a “So?” Thus, we would have at least four years of Trump. In that length of time, he could do damage beyond damage to our resident plutocracy. Consider the trajectory of a mind we have for too long now been observing. Trump might turn from building a Great Wall across the Mexican border to fixing the potholes and hiring illegal immigrants to do it. He might put the kibosh on the Trans-Pacific Partnership and then introduce universal health care coverage after eliminating the Affordable Care Act while increasing taxes on capital gains on Monday and lowering them on Tuesday. He most certainly will bring back elephants to the circus. He may start a war anywhere, maybe Canada, but then cancel it by revoking all military-industrial contracts. He may decide that climate change is caused by humans in Kansas but unaffected by humans in Nebraska. He might nominate Elizabeth Warren for the Supreme Court or Rush Limbaugh. (? )Chris Christie will go to the United Nations or Chief of Staff. He may ask Hillary to return as Secretary of State or appoint Melania for the job. Whom would a President Trump choose to replace Scalia? The answer to this question may unravel the thread of what I am suggesting here. We have already seen Trump’s vetting process on The Apprentice. But would Trump’s nominee face a tougher review in The Senate than Hillary’s or Cruz’s or Rubio’s? The hope that the exploited, described as “Losers” and “Moochers,” will experience a Great Awakening as to the real circumstances surrounding their plight is also a Great Hope that every sort of Socialist harbors. Secondly, No. Comparatively speaking Trump will do less damage to the Bottom 80% than will Marco Rubio who will be at the beck and call of that resident power elite doing the damage. (?) One of the causes of the present feudal divide is low taxes on investment income and Marco wants to get rid of such taxes totally. Whatever a shrunken Federal Government needs can be supplied by payroll taxes. Marco’s rule may be a more certain igniter of warfare in the streets than a Trump rule. How much damage Trump will do is of course unknowable but compared to Rubio, the difference is in kind, not degree. Like all the sly Roman megalomaniacs, Trump will immediately know when it is time for bread & circuses. (?) Without any kind of guiding rule except his own inclination, a President Trump would be as likely to open the Treasury to the masses as to break them with austerity or crippling taxes. Robots programmed by software of “true Conservatism,” such as Rubio and Cruz would have no such flexibility. An equal chance that Trump would be blind to a rising revolt, focused only on his own mirror image like the lady in the fairy tale. Trump clearly has no end envisioned and therefore not only would have no reason to justify horrible acts but could conveniently drop any goal and grab another. (?) That President Cruz would do more damage to this country and every country as well as the planet than President Trump needs no great argument. Republicans should fear Cruz more than Trump for Cruz is clearly a man who would truly seek to create a “New Order” while Trump order is disorder, impossible to carry out any design, even if he had one that could extend beyond a day. It is difficult to say what a narcissist on the edge of solipsism might attach himself to and for how long. Trump is not a danger to the country (?) but he is a danger to the Republican Party and their “true Conservative” policies, which enrich themselves and immiserate everyone else. The bet here is that Trump is more a danger to plutocratic order than he is to the democracy it has replaced. But it’s a bet and the odds not set. Hillary is far less a danger to plutocracy than is Trump because, except for a cosmetic wash, which even many of her supporters think is phony, of racial, ethnic, gender and sexual identity politics, she is a card carrying member of globalized, techno-financialized capitalism. After eight years of her rule, a Trump-clone will appear (?) this time with even more support from the “uneducated,” whom Trump loves. Conditions after Hillary’s reign may provide fertile ground for a Stalin descendant, but it is also possible that cybertech and cell tech and so on will have led the discontent into pleasant realms of virtualized reality. The best way to reestablish the Republican Party’s image is to elect Hillary who will not tamper with the foundational ills that are driving the Many, not the gentrified equestrian class but the Many, into angry Jacobites. That frustration and anger can only increase under a new Clintonism. (?) We are now way beyond seeing any better future by bending and bowing to a Market Rule that has torn apart any semblance of a level playing field and left us with a feudal reality. Acceptance of that corruption of egalitarian democracy defines both Hillary’s realism and her pragmatism. Think of the situation this way: most of us are now locked in that small room portrayed in the film The Room and what Hillary will do is help us to accept it as our reality, live in it as the mother and son do structuring their lives for many years, establishing a “freedom” within the confines of that imprisonment. Bernie Sander has traced the Nile to its source and that source is an economic system allowed its zero sum game of competitiveness to plunge us into plutocracy. Sanders has kept his focus and asked us to keep our focus on this root problem. Hillary Clinton, on the other hand, has stoked the American cultural imaginary away from this root problem, as does every Neoliberal, and directed us to effects and asked us to focus on them as root causes. Neoliberals, who do not take their eye off profits to shareholders, can have no better shill than Hillary in directing you, as does a carny con man, to look one way while your pockets are being picked. Because Liberals and Neoliberals share elite positions at the top 20%, they appreciate in concert Hillary’s usefulness in keeping the gaze of the Many away from a system that has put them at the top. True, they scrap over who plays the race card, and whether women can be free without abortion rights or equal pay, or whether marriage is this or that but on the one all powerful, driving issue — Market Rule — they are in lock step. The only party of the Living Well and Living Better Each Day is the party of Compound Interest. Best strategy for the Conservative Purists at this point (? ): Unnerved and filled with portfolio fear and trembling by the thought of a Trump presidency, they should openly challenge him while cursing Hillary but in the ballot box vote Hillary. And every effort should be made to keep secret Wall Street funding of her campaign. The best strategy might be to offer Trump a new Reality TV show, long term contract in return for dropping out of the race. The best way for Liberals and Bernie Sanders supporters to accomplish what Sanders will be prevented from accomplishing is to curse Trump but in the ballot box vote for him. The best way to send the Republican Party and the plutocracy that pulls its strings into a fatal nose dive is to elect Trump. If Trump is elected and impeached (? ), any Democrat, perhaps Elizabeth Warren or the Green Party’s Jill Stein might easily become our first female president.(?) And undoubtedly, the Green Party will loom more prominently in the American cultural imaginary as glacial melt attacks like some alien entity in a Sci-Fi movie. See above caveat emptor regarding impeachment. Also possible that Megyn Kelly might run and win the pay back vote.